The Twain Shall Meet: Bill C-51 Is Insidious Mr. Harper ~ Personally, I Can't Wait! Bill C-51 Is Insidious Mr. Harper ~ Personally, I Can't Wait! The Internet is ^NOT Always a Safe Place. Enter the Harper Government. They say that they have a plan to make it safer. They say that they have a plan to rid it of misinformation. They say that they have a plan to help catch criminals using it. They say that they have a plan that will make the information found on the web more reliable. They say a Lot of things! The Harper Government's answer to all of these problems is Bill C-51. 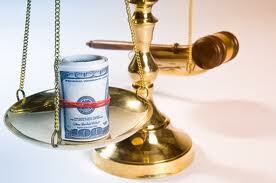 It will make three changes to the existing Legislation. 1) It will make using an online 'Alias' while spreading what ever they decide to be 'misinformation' illegal. 2) It will make it mandatory for all Internet providers to supply real time information about the identity of it's clients to the Government without judicial oversight. It will also require that all Internet providers disclose their technical surveillance capabilities within six months of the law taking effect. (It is promised within the first 100 days of the throne speech in late May or early June, 2011) Follow-up reports are also required when providers acquire new technical capabilities. 3) It will establish new powers for the police. These include new transmission data warrants that would grant real-time access to all the information generated during the creation, transmission or reception of a communication including the type, direction, time, duration, origin, destination and termination of the communication. So, what are the implications of this Insidious legislation? I really hate to speculate. 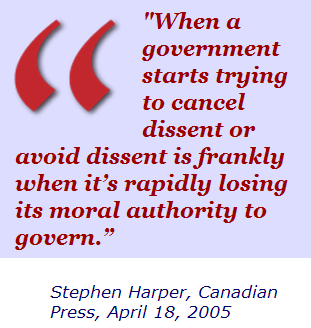 But it is obvious that the Harper "Majority" Government is ^NOT going to apologize for trying to cancel dissent, and that in his own words, Harper is rapidly losing his moral authority to govern. I am convinced that this will have to be challenged at the level of the Supreme Court of Canada. I am also convinced that that will have to happen before Harper replaces enough of the nine members to have all of his anti-democratic and in some cases illegal activities to be rubber stamped and accepted as "just the way it is in Harperland". I am sure also that many of us want Harperland to still be recognizable as the Canada we know and love. Personally, I am confident that I will not be affected by this particular legislation, as I have been using the Alias "The Twain Shall Meet" for over 4 years, and I have never hidden my identity from anyone. In fact, I have long objected to CBC.ca's policy of keeping me and all others as anonymous as is possible. They will NOT publish personal information, or anything that tends to identify even those who want to be known, at least not in the comments. They do reluctantly allow a poster to use their own name, and very recently to connect through facebook. Sadly after 4 years that would require a change from the moniker that I have come to be identifyable by. A quick google, however of "The Twain Shall Meet" will instantly connect to my blog, my profile page on CBC.ca, and with very little effort allow you or anyone else to get my personal information through Facebook, the Fan page for this blog on Facebook or to view my videos on Youtube or through Xtranormal. The new wording of this intended legislation goes beyond anonymity and makes it illegal to spread misinformation on the web or in fact by any method. Only a juvenile mind like that of Harper could write such unworkable laws. Who is the ultimate arbitrator of the veracity of all of the Billions of pieces of information on the net and who in their right mind thinks that it is possible to sort it all out? For instance, I have long maintained that Harper is a "Problem Child" and have clearly, on some occasions, qualified that statement as my opinion. I have often maintained that Mr.Harper is a "Bully" and a man consumed by a "Cult of Self". I have never spared the epithets that in my opinion describe this most inappropriate and ridiculous man. Personally I can Not wait to see the veracity and accuracy of those statements argued in Court. I suspect that a quick reading of Bill C-51 should provide all the evidence that is required to prove them. I would also like to ask the "Right Aweful Stephen Joseph Harper" if he realises that the "Astroturfers" he has been paying to, in his mind, "Correct" 'online misinformation', each of whom are paid to spread his (Harper's) opinions and not their own, and to use (each of them) some dozens of fake identities, and if he has any idea how this law will consider them? I suspect that he believes that he is above this law, as he considers himself above all other laws, whether Electoral, Criminal or International in nature. In many respects, this law may just be much more dangerous to the Harper "Majority" Government, than it will be to the average law abiding Canadian dissident. See you in Court, Mr. Harper. You may have millions of dollars in Taxpayer's cash and like always, will ^NOT hesitate to waste it on hundreds of lawyers, but in my opinion, they will all risk having a fool for a client. sheer brilliance, Kim. Fight lies with Truth. An excellent article with valid points made! I heard about that horrible law Mr. Harpoon proposes in Parliament and for me, it's simply another surreptitious method of muzzling freedom of speech in our fragile democracy. Let's ^NOT fear this proposed law which will be included in an omnibus bill, a common tactic used by Mike "the knife" Harris during his reign of terror in Ontario. We must ALL be bold and continue our criticism of Harper and his Cons! IF we do ^NOT and become intimidated by it, democracy will become a distant memory for people in Canada! (I can't select a profile before posting this comment as I do ^NOT have one, so let me say I'm that "wascally wabbit" who criticizes Mr. HARPOON frequently). Wascally is apt title. Thanks for the Great comment and please feel free to attempt to reach me on another level. I know you already from CBC.ca and other "Good Fights", and have long, as it says above, found it difficult to connect through that media, with like minds. But hey, what can ya do? CBC.ca is Mainstream Media afterall! Kim this is now my NEW Favorite of your Blogs! I see some of your other Blogs as certainly showing a reflection of the Relevance to Harper Cons dealings and their insidious natures. For me, this Blog shows a fine example of the TRUE NATURE of Harper and the Cons,being played out. In order to arm ourselves with the Tools to Succeed,we need to work with the Tasks at Hand, and there are many. Mr. Leaman:)Thanks for all the great Links that you have available on your Blogs too. I have been following Stephen J Harper's disgraceful record of Criminal involvement for some time now and it is "CREEPY" behaviour to find in Canadian Politics. The really disturbing thing is, this is ^NOT the worst thing to come out of the Reform/Alliance Harper Government, there is much more to learn about and share with others. Knowledge is Power and I thank you Kim for using your Power to strengthen "our" knowledge of such things.